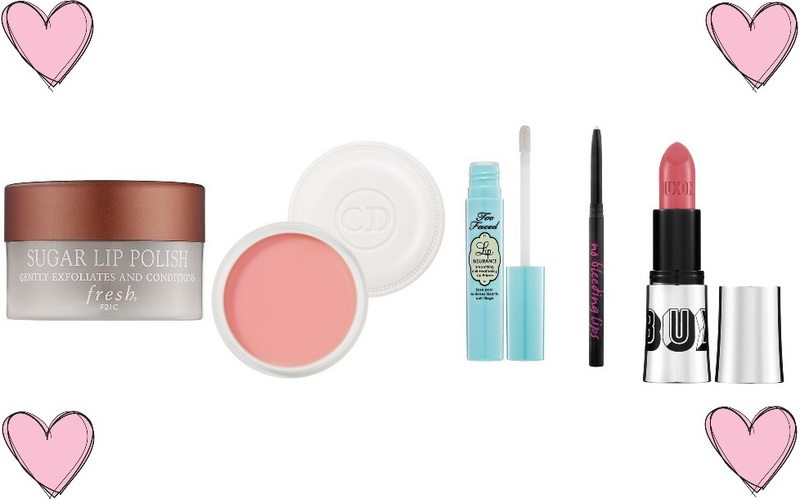 One of the girliest days of the year is just a week away, and whether you’ve penciled in a hot date, or a night out on the town with the girls, consider these your essentials for your prettiest pout yet. Nothing ruins a gorgeous lip colour quite like dry, flaky skin beneath it. Prep your lips by exfoliating them with a toothbrush, or with this Sugar Lip Polish by Fresh. Made with real brown sugar, this polish tastes as good as it will make your lips feel. Aside from applying at bedtime, I like to swipe on some moisturizer at the beginning of my makeup routine, allowing it time to soak in. I then wipe off any excess (or wear as-is depending on the day), and follow with other lip products. This Creme de Rose Smoothing Plumping Lip Balm by Dior makes your lips feel incredible (and can we note the festive “rose” scent? So very Valentine’s Day). Once you’ve given your moisturizer some time to work its magic, prime lips using your foundation, or this Lip Insurance Lip Primer by Too Faced. This not only helps prevent creasing and feathering, it also ensures your lipstick or lip gloss stays as true-to-colour as possible. In the word of makeup, I don’t think lip liners receive nearly the credit that they deserve. Yes, they prevent feathering and “bleeding” (essentially, looking like you coloured outside the lines), but they also make your lip colour last considerably longer. If you’re looking for long-wear, carefully line your lips with a colour in the same family as the lipstick you’ll be using, then finish by colouring within the lines. If you’re simply looking to prevent any unwanted shifting or creasing, try No Bleeding Lips-Secret Lip Liner by No Cosmetics. This product is clear, so you don’t need to worry about matching it to your lip colour or gloss, and it also acts as a temporary filler for those who have deeper lines around the lips. Probably my favourite step of all, is applying the colour that finishes off the look. For Valentine’s Day, my pick is Buxom Full Bodied Lipstick in Mistress. A gorgeous pink with a satin finish, this lipstick offers full coverage and gently plumps lips as you wear. Apply your lip colour, blot with a tissue, and finish with gloss if your heart desires (pun intended!). ← The Ultimate Girls Giveaway!